Shepherd’s pie is a regular in our house and when we don’t have lamb in the freezer we just sub in with beef mince. If you are after a low carb version then top it with our cauliflower mash. You will find the low carb shepherds pie in our menu. You can also mix up the topping with some parsnip or sweet potato. Yum! 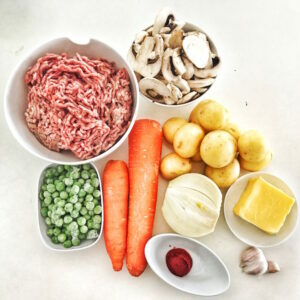 Lamb mince, mushrooms, potatoes, butter, tomato paste, garlic, onion, assorted vegetables.